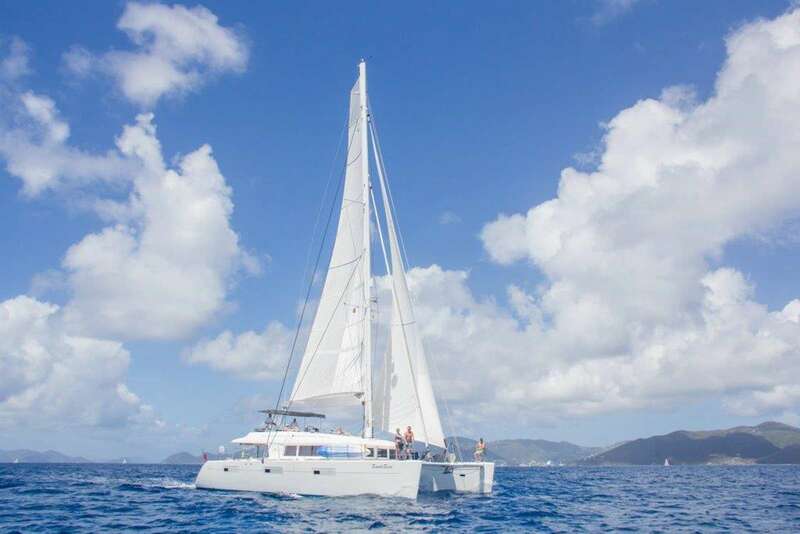 Available in 3 Locations: British Virgin Islands and St. Martin, Sint.Maarten, Anguilla & St.Barts and St.Lucia to Grenada (Including the Grenadines). 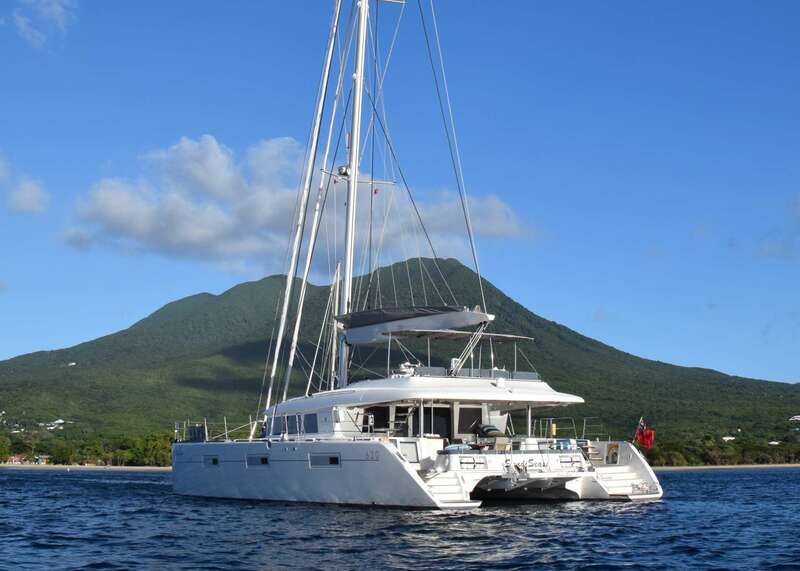 She offers one of the best Charter catamaran layouts combining sumptuous luxury and Nauta Design. The Cockpit – level with the saloon it features a teak deck, 360 degree vistas even when seated, day lounging areas and sofa bed, a large teak dining table and chairs, 4 Fatboy’s for extra lounging. A Bar, Icemaker and Fridge. Triple patio doors slide open into the Salon creating a large open plan area. Whether it be Breakfast, Lunch or Dinner this is a superb venue to relax out of the sun with a gentle Caribbean breeze. 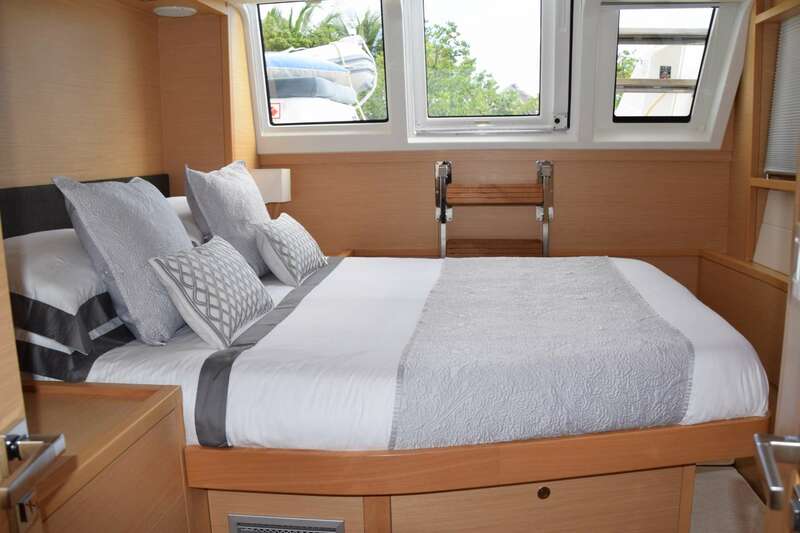 The Flybridge – the ‘piece de la resistance’ with its teak deck this offers guests a whole new experience, triple sofa bed, further sun lounging area, bar fridge. 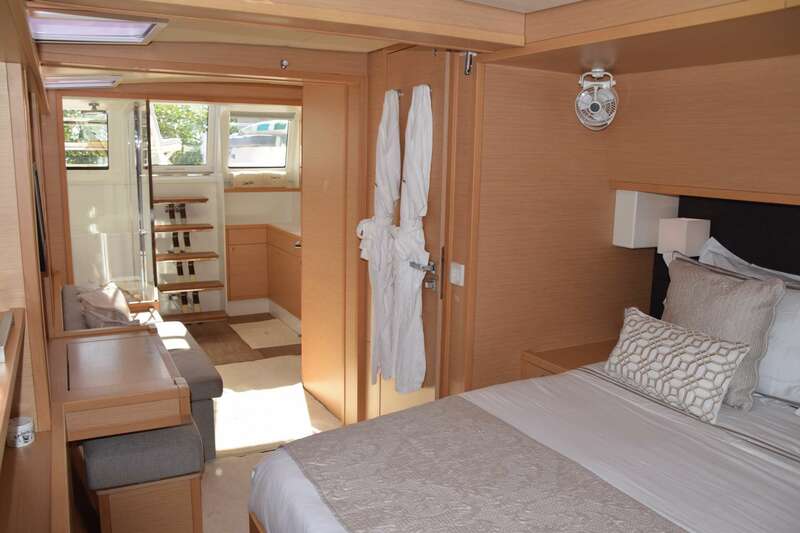 A Bimini protects the helm positions as well as the stern lounging area offering the best of both worlds. This is the place to, sunbath, view the beautiful islands, or enjoy a cocktail with canapés whilst watching the sun set. 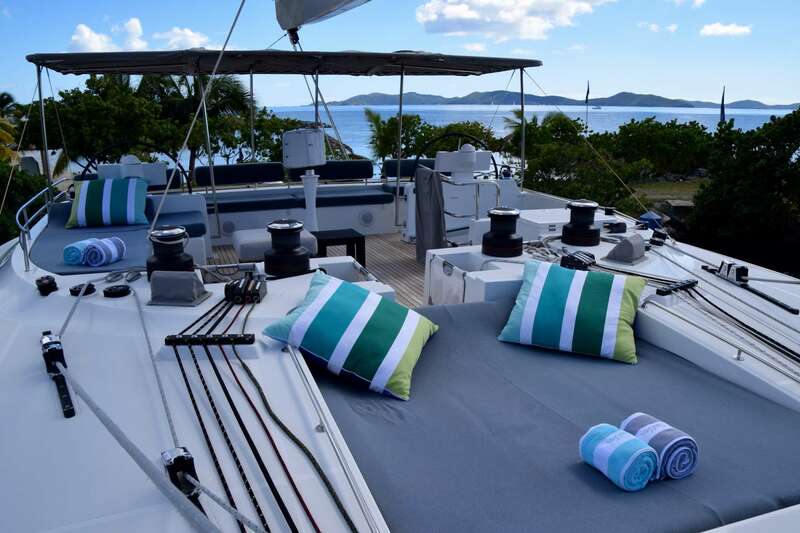 The Decks – easy to get around with a vast trampoline area on the bow to sunbath on. At the Stern Quarter there is a Gas Magma BBQ. Sugar scoop transoms offer easy access to the water for swimming with and stern ladder. 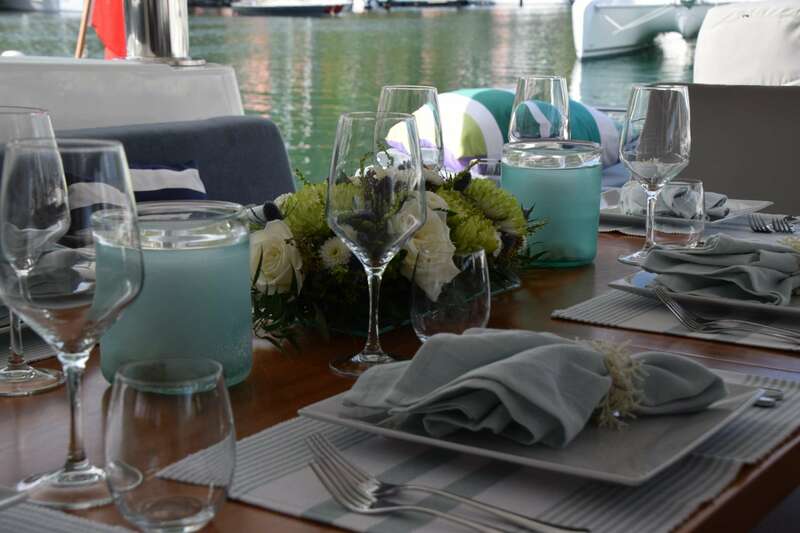 When stern too in a marina a built in hydraulic paserelle ensures easy access on and off the boat. Alternatively, when moored side too we have self levelling steps with hand rail. 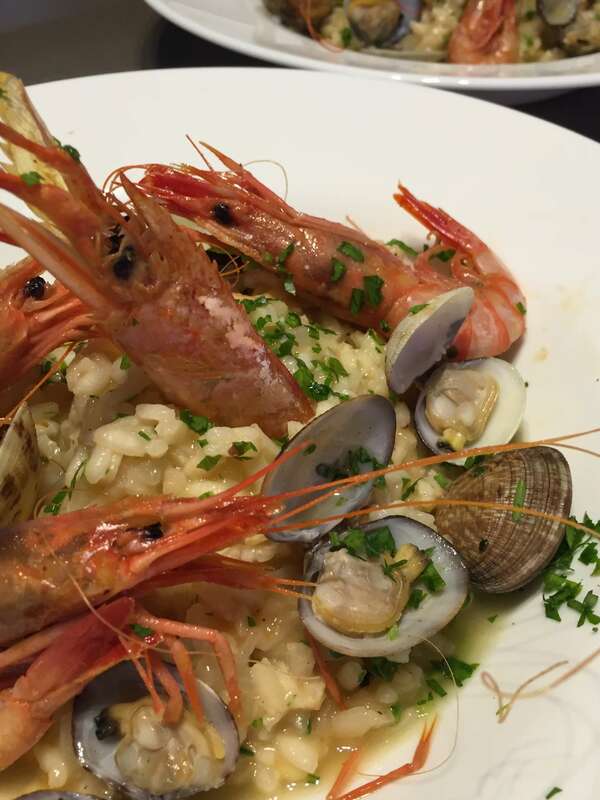 Guest Cabin 3 – Port Stern. A Queen Size Bed, luxury Sateen Cotton Bedding and memory foam mattress topper. Wardrobe and draw storage. Radio/CD/MP3 player. En -suite Toilet, Corian Vanity Basin and walk in shower. 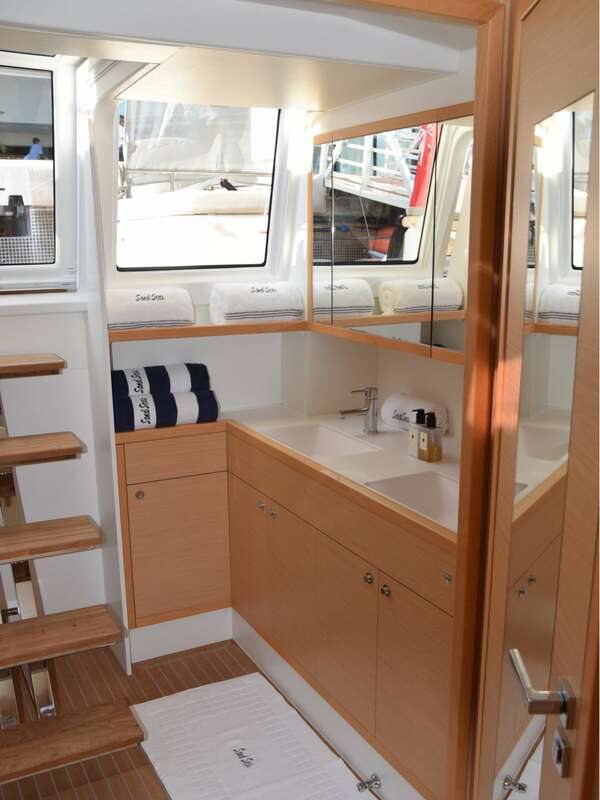 And your own stairway with sliding door to aft deck. 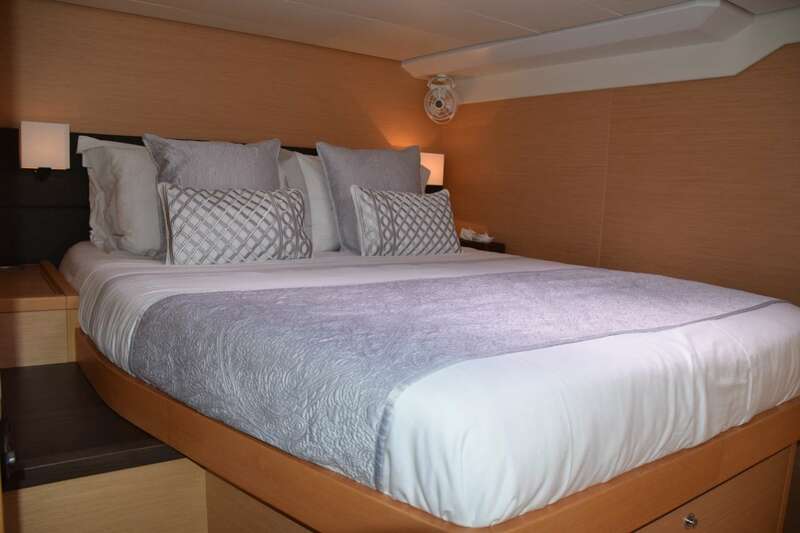 3 Luxury Cabins, including huge Master-cabin, aft Cabin and forward Cabin all with En Suite Bathrooms .